White Buffalos beat Estacada Rangers 5-0 at Estacada, Corbett Cardinals 2-0 at home. 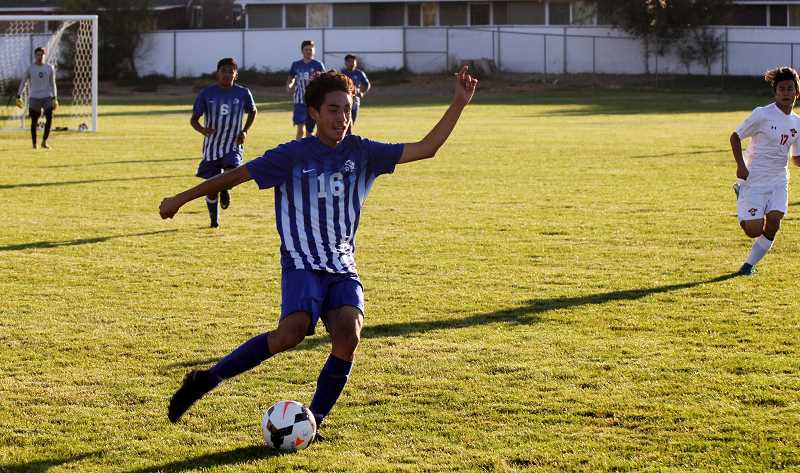 The Madras boys soccer team got back in the win column with two big victories this week. 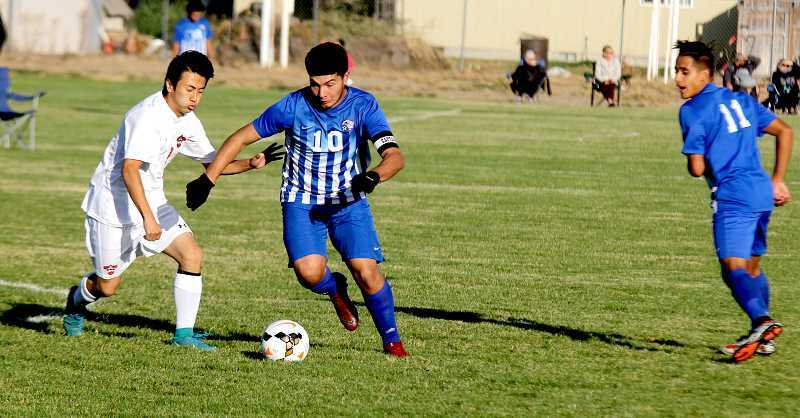 On Oct. 2, the Buffs traveled to Estacada and won 5-0. They also shut out Corbett 2-0 at home Oct. 4. In the Corbett game, the Buffs scored their two goals in the first half. 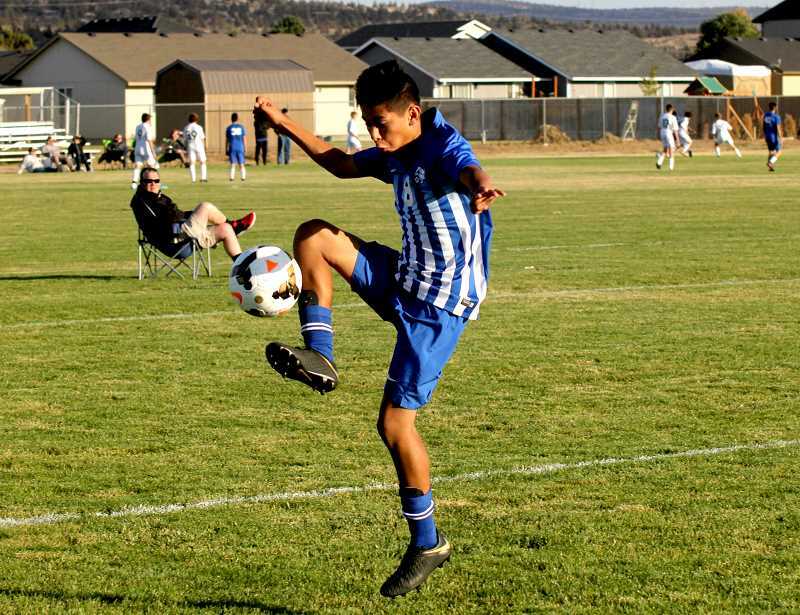 Andres Acuna was able to score both goals assisted by Alex Diaz. Diaz attacked down the wing and found Acuna in the middle of the field, who put both goals in. "They were kind of parking the bus on us, so we were having to work around the edges," coach Clark Jones said. "It is pretty hard to score on something like that, but on the other hand that doesn't allow them to get very many opportunities on us and we were OK with that." "You look at what we did well against them and what we didn't do well basically," Jones said about playing every team for the second time. "They know they will have to work hard all the way through. There are no more easy games and that is something you can say and tell players, but unless you have really experienced that, they don't realize that." "There is more of a sense of urgency and mental preparation," he said. "Normally, you figure out what your game is and you can get into that flow. Our flow is getting on the attack and when you keep attacking, the other team can't score. That is what we are going to keep doing and make other teams try and stop us. We are not going to change a whole lot of what we do. Just basically don't make the mistakes we made the first time through." "The first half of league was ok," senior defensive captain Tony Giron said. "It was not the best, but we have definitely stepped up now. We have been talking and communicating and really finding a rhythm for the second half of league. Two wins, no goals against us, we are going to do good." The Buffs have a game at North Marion Oct. 10, and a home game against Gladstone Oct. 15. They also play in Molalla Oct. 17, and will look to avenge their only league loss. All the games will begin at 4 p.m. The Buffs tied North Marion 2-2 Sept. 19, at home and lost to Molalla Sept. 27, at home 4-1, without their full team. They also beat Gladstone 2-1 during an away game Sept. 25. "Going to North Marion is never easy," Jones said. We have had success at Molalla in the past and we feel like we can go in there and give them a good game. We should be healthy by then. Gladstone we play here and when we get them off turf and on a full-size field, it makes a big difference. We are not going to reinvent the wheel and change a whole lot. At this point in the season who just have to exploit what is given." "I think we need to play our game," Giron said. "Not so much about strategy, but just play as hard as we can and we already know how the other teams play. We just need to play our hardest." "I expect us to be league champs," he said. "League champs is where we should be and hopefully top six in the state. We can't afford any more losses or ties. Nothing but wins."